Suffolk County Community College Equestrian Team rider Brittany Diez of East Islip successfully clears a fence during a recent show. Selden, NY - October 7, 2015 - Suffolk County Community College Equestrian Team rider Brittany Diez of East Islip successfully clears a fence during a recent show. Diez won her over-fences class and helped Suffolk clinch its first blue ribbon of the season. The Suffolk County Community College Equestrian Team, only in its second year, now boasts 25 riders, finished fifth out of 10 teams last year and is the only junior college in the region to have a team. The team was recently honored as the President College for the region that includes Stony Brook University, St. Josephs College, Dowling, LIU Post, New York University, Columbia University, Hofstra University, Adelphi and Molloy. 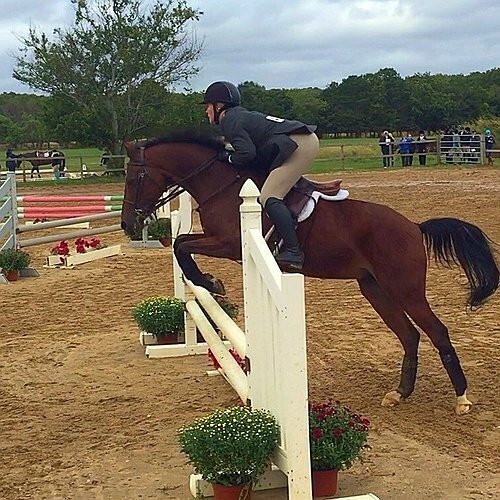 Suffolk’s next show will be on October 11 at the Olde Towne Equestrian Center in Selden. Suffolk will also be hosting the regional finals in March 2016. Subject: LongIsland.com - Your Name sent you Article details of "Suffolk's Equestrian Team Captures First Blue Ribbon of '15 Season"